Making informed decisions about the technologies that support your business are critically important and often confusing. This is especially true as it pertains to your choice of a phone system. The major telecommunications issues for 2013 include rapid transformations prompted by mobility issues, cloud services, big data requirements, high speed video caching and the proliferation of mobile apps. Concerns over security, bring your own device issues and even natural disasters continue to present technological challenges for IT specialists. It has become increasingly difficult to stay current with the communications industry. According to a recent Gartner report, the average small business owner spends 25 hours deciphering service plans before selecting a telecom plan for their business. Unfortunately, information overload often results in many business owners simply defaulting to the most familiar provider without understanding other options. The good news about the telecommunications industry is that the services keep getting better and more affordable. One of the best new telecom options is a Hosted PBX (private branch exchange) phone system that is available as a hosted service managed by a third-party provider. The service provider is typically a telecommunications, Internet or Cloud provider that hosts the equipment off-site and delivers the telecom services via the Internet. This frees the business from investing in the infrastructure of costly telecom equipment while still having access to features such as voicemail, fax, touchtone menus, automated greetings, video conferencing, call auditing and more. The PBX provider will handle call routing from their own site in addition to handling the responsibility for both the equipment and software. With a Hosted PBX, advanced call routing and Auto Attendant, any size business can look bigger. You can ensure that calls are routed to the right person if they are in the office, on the phone or in the field. Your business can replace an old legacy system with state of the art technology at a fraction of the cost. 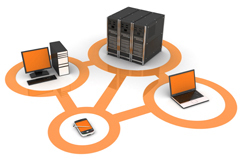 The PBX host is a provider that specializes exclusively in telecom services. Their business is to deliver secure and reliable telecom solutions to their clients. The PBX host provides the availability to scale up or scale down as needed; seamlessly handle the upgrades; and keep you informed about new services. Switching to a Hosted PBX service has never been easier. Your new phones arrive at your location fully pre-configured, ready to plug in and start using. Plus you keep your existing phone numbers. In today’s business world flexibility and productivity are key ingredients for success. With our powerful Unified Communications solution, you can use mobile phones, fixed phones or soft phones with only one number, one dial plan and one mailbox. This service is not simply call forwarding, find-me/follow-me or simultaneous ring. Hosted PBX is the biggest breakthrough in IP telephony as it relates to simplifying communications and enabling today’s mobile, virtual work force. As the business world becomes increasingly competitive, business owners need the right tools for the job. Hosted PBX is one of the best tools to consider. Your business can save money on equipment, labor, maintenance and phone bills while enhancing connectivity, flexibility and service quality for both customers and employees. Strand Technology can work with you to assess your telecommunications needs and develop a customized plan for your business. As a business owner, don’t you want to focus on keeping ahead of the competition – not spending time researching a new phone system? Strand Technology will work hard to make sure your telecommunication transition is seamless and pain free. Give our office a call and one of our experts will be happy to help you.